Asha Bhonsle, the Melody Enchntress sets the tone for the weekend with her presence in SaRaGaMaPa L'il Champs.. Get ready to sing and swing to “Aneek & Mauli’s favorite songs as well, this Saturday. SaReGaMaPa L'il Champs has a very special guest in their sets this weekend. On both the days the Queen of Vocal Versatility - Asha Bhosle will be there as the special guest. You can expect sheer magic in the Masti ki Pathshala considering the theme on popular numbers, the brilliant performances by the participants, and the euphoria on the sets with the presence of the Queen of music herself. Friday’s theme is Asha Bhosle Special. 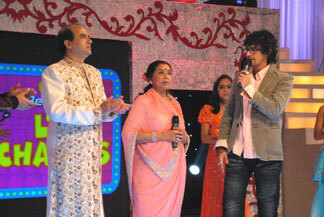 The show starts with a rocking performance by Aditya on the R D Burman hit “Duniya Mein Logo Ko”. Totaram Tanmay impresses once again and steals the show with his dazzling rendition of “Khullam Khulla Pyaar Karenge HumDono”. You will get to hear some very popular Asha Bhosle songs attempted by the participants. Asha ji, not only cheers and encourages the L'il participants, she also gives them some very valuable tips. She asks them to take the path of classical music rather than the Hip Hop music prevalent today. Saturday will remind all viewers of Challenge 2007 days and the theme is “Aneek & Mauli’s Choice Special”. These L'il contestants will be singing the favorite songs of the two SaReGaMaPa Challenge 2007 contestants. And they all give out some dazzling performances as well. But it does not end here. Mauli fans, here is a treat for you all - be ready to watch Mauli’s encore of her immensely popular Maiyya Maiyya act. There is more to come - Sonu sings his hit number “Deewana Tera”. 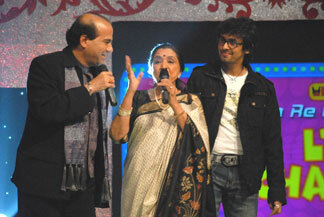 Then comes the performance of the day - Asha Bhosle shakes a leg with Suresh Wadekar and Sonu Nigam on the song “Haal Kaisa Hai Janaab Ka” and leaves the audience spellbound and wanting more. Tune in to Zee SaReGaMaPa L'il Champ on the 23rd and 24th of Nov at 10 PM IST to catch all action and more and have a whale of a musical masti time.